We often hear that self determination is one of the most admired personal traits that an individual could attain. Athletic and entertainment superstars often attribute their excessive persistence as the key to achieving their various successes. Certain people allow themselves to live a far less meaningful life and create many reasons or excuses for their rationale. They believe they have no responsibility in creating the dramas and traumas that have adversely affected their life. When we truly attempt to better ourselves or resolve a complication involving others we see ourselves meaningfully. When thinking about plants and animals we bring a different criteria to this thought process. As a society we believe animals have a powerful survival mechanism built into their existence but sense it is more instinctual rather than a matter of a meaningful intellectuality. In the case of microbes and foliage we claim that their search for food, water, and light is attributed much more to the vegetation's endurance rather than having a thought out life span plan. 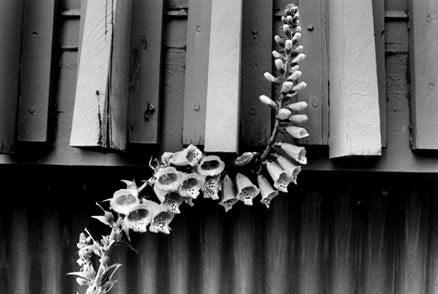 Possibly this foxglove growing up beside our deck is graphically revealing that flexible adaptability is nature's most consequential life sustaining virtue.